Pearlgate is proud and thankful for the support and partnership of the City of Mount Pearl in providing the Pearlgate Complex. Pearlgate is also a Participating Member of The Mount Pearl Sport Alliance. Pearlgate is a successful club. 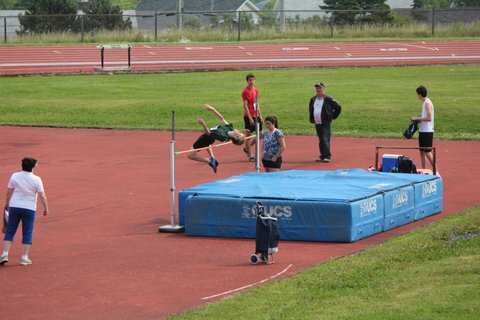 Many of our athletes have won provincial titles and many have went on to compete, and medal, at the national level. Exceptional performances are sometimes rewarded with gold but True Gold can be won everyday in simply striving for personal best and in sharing the experience with others along the way! Track and field is one of the purest forms of athletics. The disciplines of track and field involve running, jumping, and throwing and encompass the physical movements in almost all other sports. The training for sprints extends to sports such as soccer, hockey, football, and tennis where foot speed is essential for success. Jumping event training creates leg power that would assist the downhill skier, volleyball, or basketball player who wants to advance in their sport. The diversity of throwing event training has implications for baseball, football, and power sports such as bobsled and weightlifting. Endurance development for long distance running is the same training that brings success to rowers, soccer players, cross country runners, and skiers. Track and field encompasses over 40 individual event disciplines for male and female. On the track are short sprints, long sprints, middles distance running, and long distance running. In the field are the vertical jumps, horizontal jumps, and four varied throwing events. There is also multi-event decathlon and heptathlon which combine several disciplines into a single event. Having such a varied menu of activities within one sport is truly unique, and provides a means of inclusion not found elsewhere in the sporting world. The powerful 125kg shot put athlete will find opportunity for success in the same arena as the tall, slender high jumper, the wheelchair miler, or the Special Olympics sprinter. Track and field is a sport for anybody. Clubs like the Pearlgate Track and Field Club provide athletes with the facilities, equipment, a positive training environment, and numerous competition opportunities. The only thing athletes need to bring to practices and competitions are their running shoes and work ethic. With very little personal equipment required, the sport track and field is accessible to people across a broad economic spectrum. Track and field is a sport that allows for participation at any age. From school-age children participating in a run-jump-throw program, to seniors participating in a masters competition, there are many ways to stay involved for life. Many athletes who retire from competition find their way into coaching, officiating, providing leadership, and mentoring to younger athletes. Many popular sports and games require two teams in order to prove relative skill levels, or judges to provide a subjective evaluation of performance. Track and field belongs to a group of objective sports like rowing, swimming, or downhill skiing, where performance is measured in centimeters and seconds. More importantly, these measures can be used to chart personal improvement independent of other athletes.